Walsine Pierce: VETERAN'S DAY! Hurray for the "good" guys & gals. VETERAN'S DAY! Hurray for the "good" guys & gals. No mail today. The government is taking the day off, with pay. Bet they love Veterans Day, huh? I didn't see a flag flying in the neighborhood today. I did hear a lot about Veteran's Day on TV however. I'm in favor of honoring our countries veterans. I still tend to think of the day as Armistice Day. In November 1918 President Woodrow Wilson proclaimed the day as a Commemoration of the the 1917 armistice of World War I, the war to end all wars. The "Treaty of Versailles" was signed on the 11th day of the 11th month of 1917. On May 13, 1938 the day was made an official holiday. Because of all the World War II vets that were recalled to fight the Korean War, in 1954 the 83rd Congress inserted the word "Veterans" in place of "Armistice" in the holiday designation. 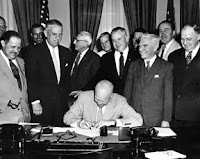 The bill was signed by President Dwight D. Eisenhower. Since my family has been in this country they have been involved in all of their countries wars. With the exception of my father, who was drafted, the family all volunteered. Great Grandpa Indivan Pierce was in several small and two major battles of the Civil War. He was grieviously wounded at the Battle of Berryville. Dad was in the Army in World War I. My older brother, Henry, joined the Navy and further volunteered for extremely hazardous duty in the Armed Guard and was involved in the Battle of the Atlantic against the Nazi subs. It should be noted that Henry was exempt from serving at all due to having a war essential job. He could have been safe and earned big war time dollars. Instead, he turned down the exemption and joined the Navy. He had his "Irish" up and wasn't about to miss a fight! My brother Ray had a special story. Like his brother and father, Ray was a journey man molder--a highly skilled job that carried a full exemption from the war. Wanting to follow Henry, Ray tried to turn down his exemption and join the Navy. He was not permitted to do so. Talking about getting one's "Irish" up, with his red hair, Ray got his back up and took on the government. 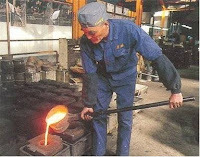 He refused to continue working in the foundry. With full government control of who worked where, he was not permitted to take another job. That being said, workers being difficult to come by, Ray had no trouble getting hired "under the table" as a deck hand on a river boat. In three months, when his exemption expired, Ray again tried to volunteer for the Navy. At that time people in jail could volunteer to serve in the Army and be let out of jail. Ray was included with 16 jail birds and put in the Army. His service is a fascinating example of the miltary inefficency and the seemingly foolish moves our veterans had to endure. After basic training, Ray was sent to a Light Machine Gunner's school. After graduating from the gunner's school, someone discovered that he was a journeyman molder. He was then transferred from the Infantry into the Army Engineers and sent to Molder's School. Yes, he had been molding since he was a kid and probably knew more about molding than the instructors. After graduating from molding school, would you believe, he was assigned to guard German POW's in Montana. As the Army scraped together forces for the invasion of Japan they remembered that Ray was a trained machine gunner. He was returned back to the infantry at Fort Lewis, WA. On a troop ship he had passed Hawaii when the atom bomb ended the war. He was returned to Fort Lewis and discharged. At age 16, not letting the truth get in the way of a good story, I added a year to my age and joined the WV National Guard. At 17 I joined the Navy. I was the radioman on the USS Yuma ATF94 in the war zone when the Korean War started and was "froze" in the area for a one year extension of my enlistment. According to my DD214 I served for four years, nine months and seventeen days. The son's of my brothers and sister, Jim Pierce, Henry Lee Pierce and Harold Sturgeon, were all in the Vietnam War. Henry Lee made a career of the Navy and retired as an officer. Thankfully, none of my grandsons have had to serve but several of my more distant relatives are still in the service. My first cousin, Ira Shamblin, died in battle in North Africa and Henry's brother-in-law, Jim Byus, died in battle in France. My wife's father was a wounded Navy vet and her grandfather, John Strader, served under General Patton through Italy and France. Yes, he referred to Patton as "old blood and guts". At the risk of being a cheerleader for myself, lets hear it for our veterans! "This nation will remain the land of the free only as long as it is the home of the brave" . God Bless, and thank you Lord for our liberty! Your Jim Pierce wasn't ever stationed at Fort Hood in Killeen Tx, was he?